Some may initially be drawn to the field house by the deafening clamor of hundreds of sneakers continuously pounding upon the ground. Those who prefer order may immediately regress back into the hallway upon witnessing the seemingly chaotic anarchy. Amidst the astonishing quantity of AHS students, there are telltale signs of organization at a track practice. Long distance runners in one corner are stretching before an extensive run outdoors; throwers are beginning their warm-ups in the far end; sprinters are starting their workouts on the track. Over 250 students from a wide variety of social groups and grades are scattered throughout the area, and all seem to communicate like one well-oiled machine. This astonishing number of participants on the team is a direct product of the track team’s “no cut” policy. This phrase means that every student of AHS is welcome to join, regardless of athletic ability or prior experience. 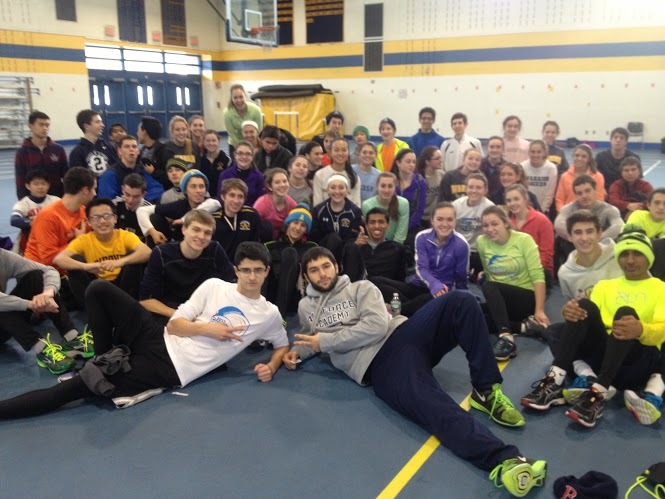 Many members of the AHS track program find the inclusiveness of the team an extremely beneficial aspect. Although there are certain drawbacks, the success of the team heavily relies on the lack of downsizing. Coach Clark-Warne, lovingly referred to as CW by her team, says that with a sport such as track, it is nearly impossible to make effective cuts without accidentally dismissing a future star. The long-distance coach said, “I don’t know who is going to be the devoted one, and who is going to be the one that will work hard.” In long distance running, hard work often yields huge improvements, and those who put in more effort are likely to rise to a higher level than those who may have initially been faster but lack the work ethic to improve. If those who originally lack speed are not allowed to join the team, the team’s overall performance would drop considerably. Despite believing that having a “no-cut” policy is one of the greatest qualities of AHS’s track team, there are a few drawbacks to the system. One of the most blatantly obvious complications is the sheer quantity of participants on the team. A larger team is difficult to manage and expensive to support. Mr. Doucette, the athletic director at AHS, said, “Sometimes [the track team] gets so big that coaches can’t teach as much or as well as they would with a smaller group.” Mr. Doucette’s logic is that with such a skewed ratio, in which the number of runners greatly exceeds that of the coaching staff, the training is often less specialized, especially considering the wide variety of skill levels on the team. However, a bit of extra effort seems a small price to pay for the opportunities given to a multitude of students. For those who are new to school, especially freshman, track is the perfect opportunity to meet people they may have otherwise never encountered. Friendships forged at track commonly exist between students in different grades, different classes, or different social groups. Despite the distinct contrasts between many of these runners, most friendships survive throughout the grueling years of high school, and truly exhibit track’s ability to bring people of different interests and personalities together in an environment that lacks stress but encourages an active lifestyle. The frustration and panic that results after a poor performance at an exclusive team’s tryouts is an experience shared by many student athletes wishing to join a team. However, track makes these feelings completely unnecessary by providing a second chance to those in such a situation. Therefore, all athletes can be reassured that they can remain part of a team, regardless of how well they perform at tryouts. Just as many second chances come unexpectedly, many now-devoted track stars never imagined they would grow to love running after joining track only as a last resort.